Know how to protect your investments in the current uncertain market. Talk to any fund manager today and he will give multiple reasons for investing in equities to gain from a possible bull run after the 2014 elections. Low valuations, improving economy and tapering of liquidity injection by the US central bank are some positives they think will propel equity markets to a high. But there are those who say it's too early to get carried away by this euphoria. Inflation, they say, is a big worry. The turning off of the US liquidity tap may have been delayed but is inevitable. Then there is the possibility of a hung Parliament after the 2014 elections. Worse, India will not return to its earlier high growth rates of 8-9% anytime soon, and that's why it's best to be cautious. For investors, making sense of this is tough. The thumb rule in such a situation is to diversify based on goals and investment horizon. Long-term investments can safely be put in equities. However, for periods less than two-three years, it's best to be safe and go for fixed income options. The latter, due to various factors that are keeping interest rates high, have turned especially attractive of late. While bank fixed deposits, or FDs, and post office schemes are some of the safest options, investors can also look at earning more than what is paid by bank FDs and Public Provident Fund (PPF). Some such options are debt mutual funds, nonconvertible debentures (NCDs) of companies, tax-free bonds by infrastructure companies and inflation-indexed bonds. The latter two have long maturities. When the Reserve Bank of India, or RBI, increases the rate at which banks borrow, it affects rates on other fixed income instruments such as bank FDs, company deposits and bonds as well. Till not long ago, almost everyone was counting on the new RBI Governor, Raghuram Rajan, to cut interest rates to push up growth. That wasn't to be. The RBI surprised by reversing the interest rate cycle in September. 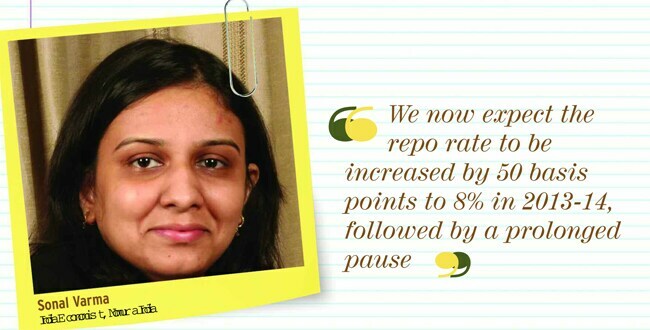 It increased the repo rate, at which it lends to banks, by 25 basis points (bps). Though this is an opportunity for investors to park money in high-yield fixed income securities, the uncertainty over which way interest rates will move in the next three-six months can make it difficult for investors to take a decision. Many experts are expecting another round of interest rate increase (which will raise yields) and hence are advising investors to await the RBI's next move. "Before any decision, investors must assess where we are and where we are headed. 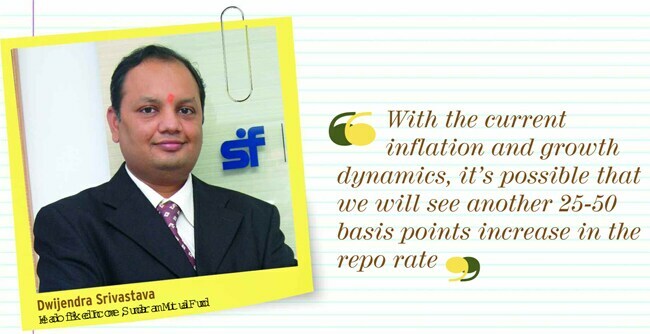 We believe that the new RBI team under Rajan will be more hawkish towards inflation," says Dhawal Dalal, head of fixed income, DSP BlackRock Mutual Fund. 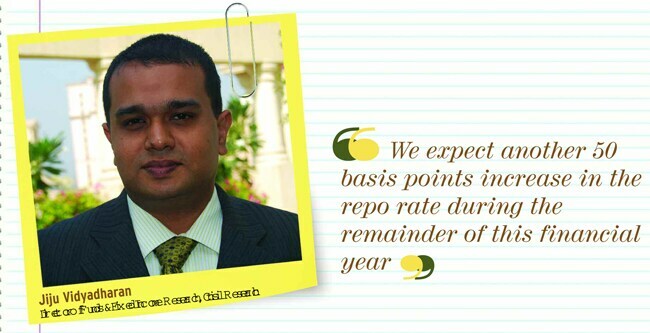 He expects the RBI to increase the repo rate from 7.5% to 8% by December. 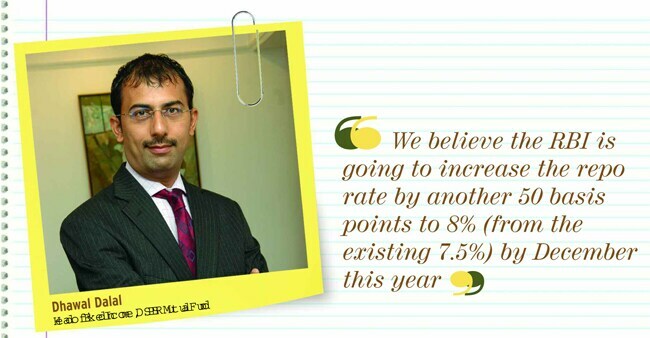 Dwijendra Srivastava, head of fixed income, Sundaram Mutual Fund, also says an increase is possible. "In view of the current inflation-growth dynamics, we may see another 25-50 bps rise in the repo rate." 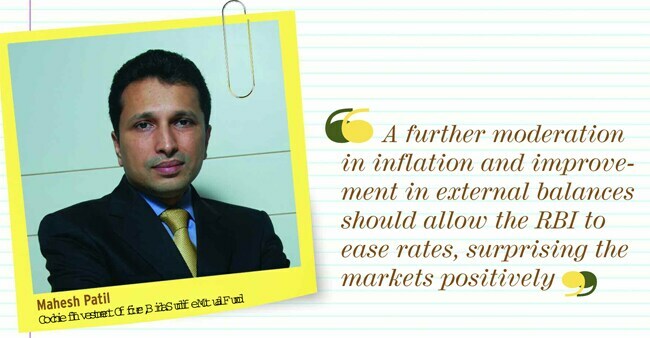 Dipen Shah, head of private client group research, Kotak Securities, says, "With consumer price inflation remaining high, we believe that the RBI will keep interest rates at elevated levels. But as much of the inflation in due to primary articles and supply constraints, we feel that a sharp rise may not be in the offing." An increase in interest rates impacts bond prices. If investors are earning more from bank deposits than in the bond market, bond prices fall, as investors sell them and park money in banks. Thus, the value of their bond investments falls. Of course, if they hold the bonds till maturity, they will earn regular income (called coupon) and get the principal at maturity. However, if they have to sell before maturity, there are chances they will make losses. For new investors, it is an opportunity to buy at a lower price and earn a higher yield. If they hold till maturity, they can gain both from capital appreciation as well as interest earned. However, due to the uncertainty about interest rates, it's a question of which side the camel sits. In spite of the uncertainty over interest rates, current bond yields and bank FD rates are still attractive and are offering decent returns with lower risk. Banks are offering 9-10% on one-three year FDs. Corporate FDs and NCDs with high credit rating are also offering this much or slightly more. Then there are tax-free bonds (many available in the market currently) offering up to 8.7-8.9% for maturities up to 20 years. The interest earned on these bonds is not taxed. The interest rates on fixed income instruments for retail investors can be gauged by yields on government bonds and treasury bills or T-bills. The 10-year government bond yield is around 8.5%, while the yield on 364-day Tbills is close to 8.9%. 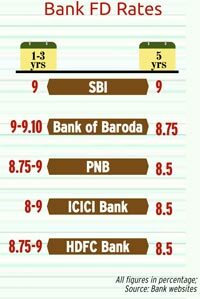 Certificates of deposits, or CDs, issued by banks and having maturity up to one year, are trading between 9% and 9.8%. Commercial papers, or CPs, issued by companies to raise money for less than one year, are trading at 9.5-10%. Though some debt fund managers are asking people to wait and watch before investing in a fixed income instrument, the existing rates are also good enough. "Unless there is clarity on interest rates, investors must exercise caution, though the cost of caution is not too high with CD rates staying around 9.75%," says Dalal of DSP BlackRock Mutual Fund. Those who want to gain from high-yield bonds should invest in debt funds as they cannot buy bonds directly due to the large ticket size involved. 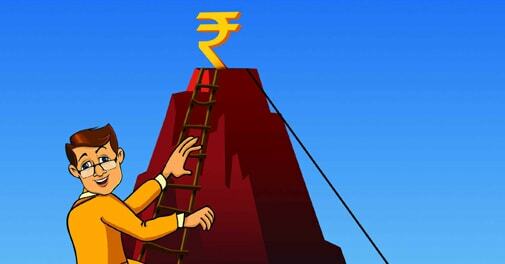 Debt/bond fund investment can be as low as Rs 5,000. Since mutual funds are managed by professionals, it is better to leave your money in their hands, as they are usually wellqualified to take informed investment bets. However, you still have to choose the funds. You can go for buy-and-hold (passive) funds such as fixed maturity plans, or FMPs, which have lock-in periods. The fund manager buys high-yield bonds and holds them till maturity. Else, you can adopt an active strategy by investing in funds that look to gain from coupon payments as well as capital appreciation by predicting interest rate movements and timing buy/sell decisions. Investors can also adopt duration strategy. Usually, longer duration bonds trade at higher yields but are riskier than securities with shorter durations, which have lower yields. Whatever strategy you adopt, it should be based on your risktaking ability and time horizon. "Strategies focused on corporate and short-term bonds can help investors navigate the current uncertain environment. Investors who have a longer horizon and are comfortable with interim volatility can build longdated portfolios," says Santosh Kamath, CIO, fixed income, Franklin Templeton Investments - India. If your horizon is 3-12 months, you can go for ultra short-term funds that invest in securities with maturity of more than 90 days and hence give better returns than liquid funds, which invest only in securities with maturity up to 90 days. According to Dalal of DSP Blackrock, there are a number of quality liquid money market instruments where one can park short-term money. Money market instruments-T-bills, CPs and CDs-are short-term securities with tenures of up to one year. "Short-term funds are beneficial when short-term rates are high. Long-term income funds can be considered only if you have a longer horizon," says, Jiju Vidyadharan, director, funds and fixed income research, CRISIL Research. He says that according to a CRISIL study, long-term income funds give better returns when interest rates are falling. Risk-averse investors can also look at traditional investment options such as bank FDs, NCDs and tax-free bonds. Bank FDs are among the safest options. At present, banks are offering 9-10% a year on deposits up to three years. The interest is compounded quarterly. One can opt for premature withdrawal, in which case the interest rate can be reduced by up to 1%. The interest earned is added to the income and taxed. Tax is not deducted at source if the annual interest income is less than Rs 10,000. However, one must mention total interest earnings in the tax return. If you earn more than Rs 10,000 interest a year, tax is deducted as per the applicable rates. However, if you have not submitted your PAN details to the bank, the tax will be deducted at the rate of 20%. And, despite earning Rs 10,000 interest in a year, if one's total income is below the tax threshold, one can submit Form 15G/15H declaring the same so that the bank does not deduct any tax. Companies can raise money from the public through FDs or NCDs. Both offer one-two percentage point more than bank FDs and are, therefore, popular with retail investors. However, the two are different in many ways. NCDs are secured instruments backed by assets that the depositors can claim if the company fails to pay them. Company FDs are unsecured. 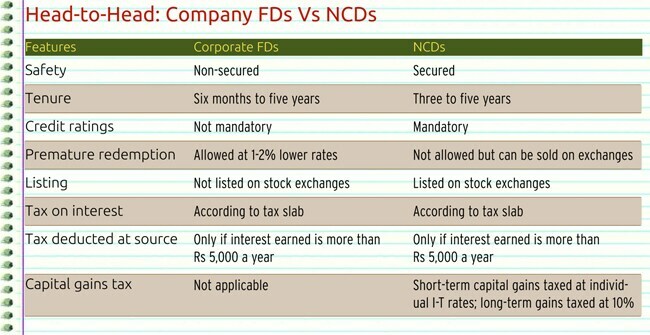 While the tenure of corporate FDs can be six months to five years, NCDs mature in three to five years. NCDs have to be rated by at least one credit rating agency. This gives investor an indication of how safe the issue is. The rating and what it means have to be mentioned in the offer document. If the NCD has been rated by more than one agency, all the ratings have to be disclosed. Corporate FDs are not required to be rated. Interest earned from NCDs is taxed according to the investor's tax slab. Tax is not deducted at source if interest earned in the year is less than Rs 5,000. If NCDs are sold in the secondary market at higher than the purchase price, the profit is considered as a capital gain and taxed. Short-term capital gains are taxed according to the investor's tax slab. Long-term capital gains are taxed at 10%. In company FDs, interest income is taxed at the prevalent rate. Tax is deducted if annual interest exceeds Rs 5,000. There is no capital gains tax. Investors should avoid company FDs offering 15% or more a year as the high rates show it is facing trouble in raising funds at more reasonable rates and, therefore, my not be very stable. Before investing in either company NCDs or FDs, they must check the company's financial position and its ability to pay both interest and principal on time. These are longterm bonds with tenures of 10, 15 and 20 years. The interest earned is not taxed. The rate of interest or coupon is less than the yields on government bonds of similar maturity. The 10-year government bond is currently trading at 8.5%. India Infrastructure Finance Company (IIFCL), which is selling tax-free bonds from October 3 to October 31, is offering 8.26% interest on 10-year bonds, and 8.63% and 8.75% on 15-year and 20-year bonds, respectively. Power Finance Corporation's issue, open from October 14 to November 11, is offering 8.43%, 8.79% and 8.92% on 10-year, 15-year and 20-year bonds, respectively. The government has allowed 13 infrastructure companies owned by it to offer tax-free bonds in 2013-14. Though interest rates on these bonds are less than those offered by bank FDs and NCDs, no tax on the interest earned makes them attractive, especially for those in higher tax brackets. The effective yield on 8.26% 10-year bonds tax-free bond for an individual in the 30% tax bracket is 11.95%. The post-tax yield on 9% FD is 6.22%. Though the interest income is tax-free, any gain from sale on an exchange is taxed. Short-term capital gains are taxed at normal income tax rates while long-term capital gains (from sale of bonds after more than one year) are taxed at 10%. Tax-free bonds are rated by credit rating agencies. The government proposed to launch inflation-indexed bonds in this year's Budget. Recently, the RBI governor said savings certificates benchmarked to the consumer price index, or CPI, will be launched by November-end. The structure of these bonds is not known yet. There can be two ways to link payments with inflation. The first is a simple floating rate structure, where the coupon rate will be CPI plus a spread. For example, if the CPI is 9%, the coupon could be 9% plus 25-50 bps. The second is having a fixed coupon and adjusting the principal with inflation. Assume that you invest Rs 1,000 at 6%. 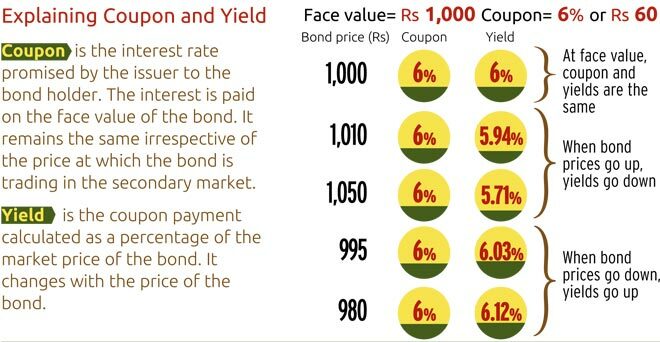 After a year, if inflation is 10%, the purchase price of the bond will be Rs 1,100 and the interest earned will be Rs 66 or 6.6%. The interest earned will be taxed as per the investor's tax slab. Other details like frequency of payments, tenure, etc, will be known only after the government issues a notification. Experts say the RBI move to cut lending rates under the marginal standing facility (the rate at which banks borrow funds overnight from the RBI against approved government securities) by 125 bps has supported short-term securities. This means short-term yields have eased and are likely to fall further. Therefore, people may start investing in short-term funds. Invest in liquid funds if your investment horizon is less than three months. If the horizon is 3-12 months, look at ultra short-term funds. Both liquid and ultra shortterm funds invest in money market securities such as T-bills, CPs and CDs. However, liquid funds can invest only in securities with maturity up to 91 days. Ultra short-term funds invest in longer maturity papers due to which they return more than the liquid funds. Other options are short-term income funds, which invest in a mix of money market instruments and corporate bonds. With 364-day T-bills trading around 8.8% and CPs and CDs around 9.5-10%, one can expect decent tax-adjusted return from these funds. Short-term capital gains on debt mutual funds are taxed at normal rates, while capital gains are taxed at 10% without indexation and 20% with indexation. Indexation is adjusting the purchase price with inflation for calculating taxable capital gains. FMPs follow a passive strategy in which the fund manager invests in highyield money market securities and corporate bonds and holds them till maturity. These are close-ended funds and so premature redemption is not allowed. With money market instruments and corporate bonds offering attractive yields, locking your money in FMPs will give decent tax-adjusted returns. "With short-term rates likely to fall as the central bank normalises the interest rate corridor, investors with known time horizons and averse to intermittent volatility can invest in FMPs," says Dwijendra Srivastava of Sundaram Mutual Fund. FMPs offer different maturity options, ranging from three to 36 months. This helps investors allocate money as per their needs and investment horizons. 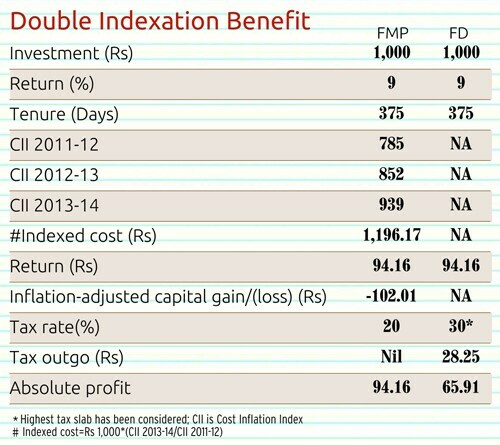 However, FMPs with tenures of just over a year (367, 370 and 375 days) are the most popular as they offer the benefits of double indexation. In this, the investment is purchased in one financial year (say March 2012) and matures in the third financial year (April 2013). The purchase price is, therefore, adjusted for inflation twice. This reduces the capital gains tax. Asset allocation approaches require that a part of the portfolio remains in fixed income securities as they provide a cushion against equity market volatility. Since returns from these move in opposite direction to that from equity markets, they are an ideal diversification tool for your portfolio. However, for retail investors , bank and company FDs and post office savings are the most popular products in this category. A smarter way to build one's debt portfolio is to also look for bond funds as they offer opportunities to benefit from changes in the interest rate cycle and gain not just from interest income but also from capital appreciation.